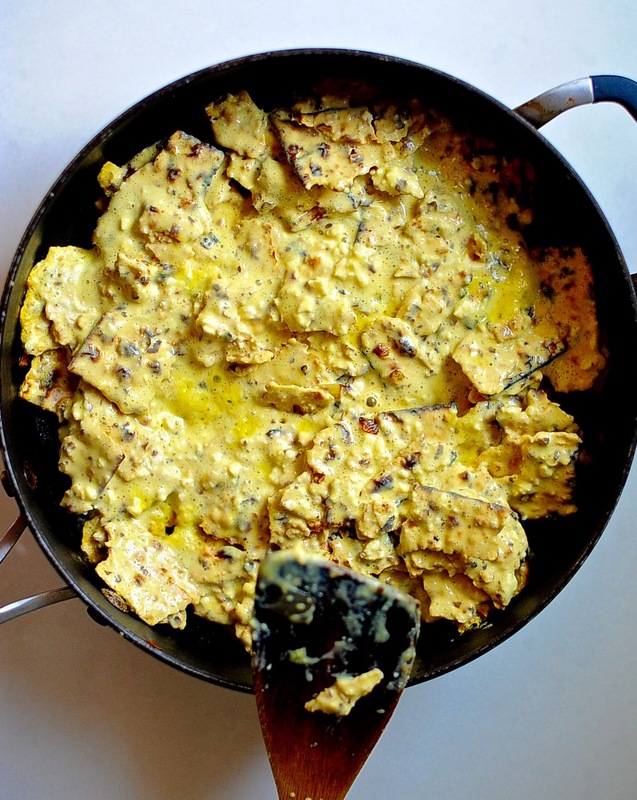 Vegan Matzo Brei is perfect for Passover or any morning spent with one you love. 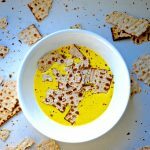 Can Matzoh Brei be made vegan? Absolutely! Silken tofu has a similar texture to soft cooked eggs, cornstarch gives a custardy texture and Kala Nama (black salt) add a slightly sulphuric back not that mimics eggs. 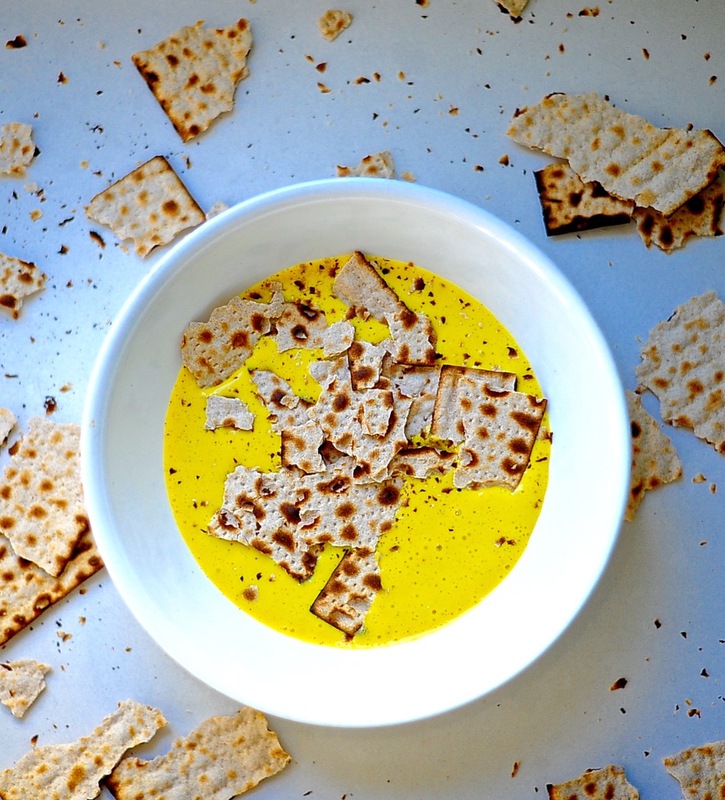 Give your broken matzo shards a quick soak in your vegan “eggy” basic batter. Once you add the translucent onions, a healthy sprinkling of salt and pepper. Here is what I think. 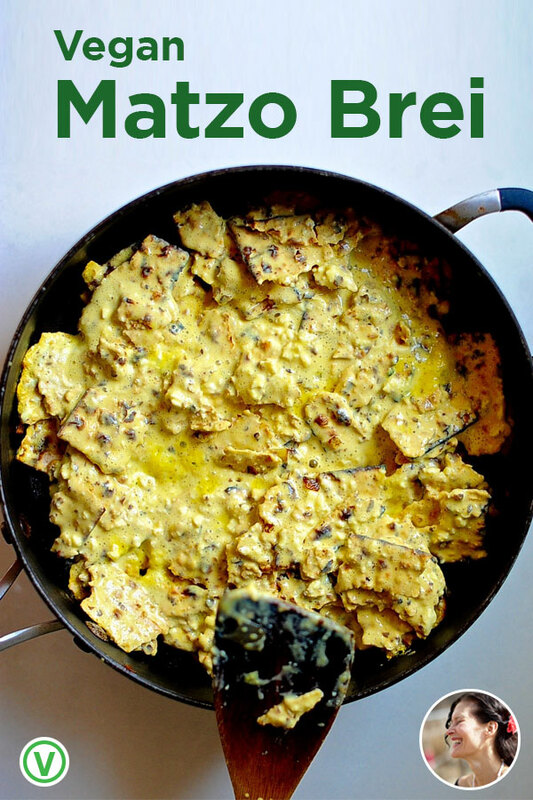 If you handed an omnivore a bowl of this vegan matzo brei they would have no idea it was totally plant based. No Idea! 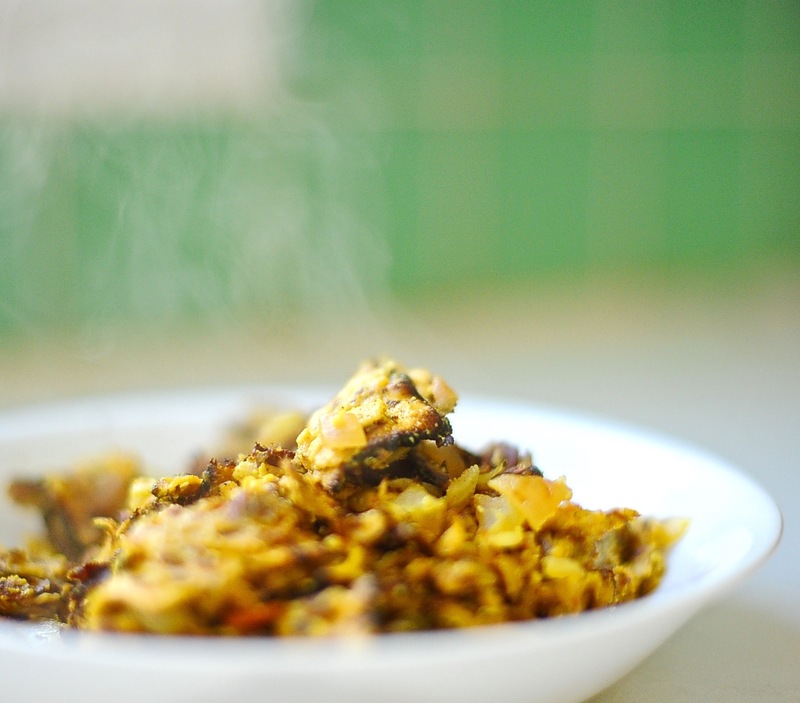 “Eggy” mounds of roughly broken Matzo cooked into peppery, salty, crunchy, yielding, curds of memory. My dad would rise before the sun, brew his bitter greek coffee, turn on the radio to the classical music station and read the New York Times. Hours later I would rise, wild haired, face puffy with sleep and stagger into the kitchen. He would quietly fix me a cup of Swiss Miss cocoa with tiny marshmallows as I gazed into space. I would hear the crack of eggs, the soft puddling sound of cream being poured into a white stoneware bowl, the rough grate of the pepper mill and the the soft crunches as he broke slices of matzah into uneven pieces and dunked them into the waiting eggy liquid. He left the bowl to soak while his pan heated. Golden butter skittered and spat across the cast iron. Unceremoniously the whole kit and caboodle was dumped into the pan and tossed and tumbled with the spatula for a couple of minutes and then disgorged to a waiting platter. More salt and pepper were scattered over the top and we’d scoop small mountains of the stuff onto our plates. Each forkful was a combination of soft eggy edged matzah, dry crisp pieces that shattered to dust, and overly soft custardy bits, peppery, salty, plain. A mish-mash of flavors and textures. He would hand me the funnies (comics) and not a word was spoken as we sat together reading the paper, sipping our drinks, eating our breakfast. I got the call at the crack of dawn on the 16th of April. Matter-of-factly the nurse on the other end told me he was dying. 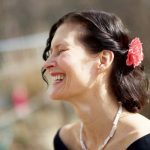 In the car, as my husband drove, I tried vainly to get my hair into the style my dad had most loved. My fingers were clumsy. I raced to his side and suddenly time slowed. The room was dim and so we opened the windows to let in the fine spring sunlight. My hand grasped his warm upper arm beneath the covers and I counted the moments between breaths. This year on his 4th death day I plan to celebrate with Vegan Matzo Brei and cocoa. Someone pass me the comics please, they are still my favorite. 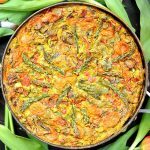 Vegan Matzo Brei tastes incredibly similar to the original. Personally I like my Matzo Brei savory and peppery. I will give you three methods depending on if you want a softer, crunchier or somewhere in the middle result. 1/2 tsp turmeric optional, for color. Sauté your diced onion in a medium sized pan with 1 tsp of oil on a very low heat until it is golden about 10 minute. Meanwhile combine in blender your 1 tablespoon hummus, 1/3 cup silken tofu, 3/4 cup non-dairy milk, 1 tablespoon nutritional yeast, 1/4 teaspoon garlic powder, 1/2 teaspoon black salt, 1 1/2 teaspoon corn starch, 1/4 teaspoon black pepper, and 1/4 teaspoon maple syrup. This is the time to add the turmeric if using. It won't affect the taste just the eggy color. Blend until smooth. Now pour the liquid into a wide bowl. If you like a soft and yielding matzo brei then crumble your matzos into the batter, stir and let soak for 5 minutes. 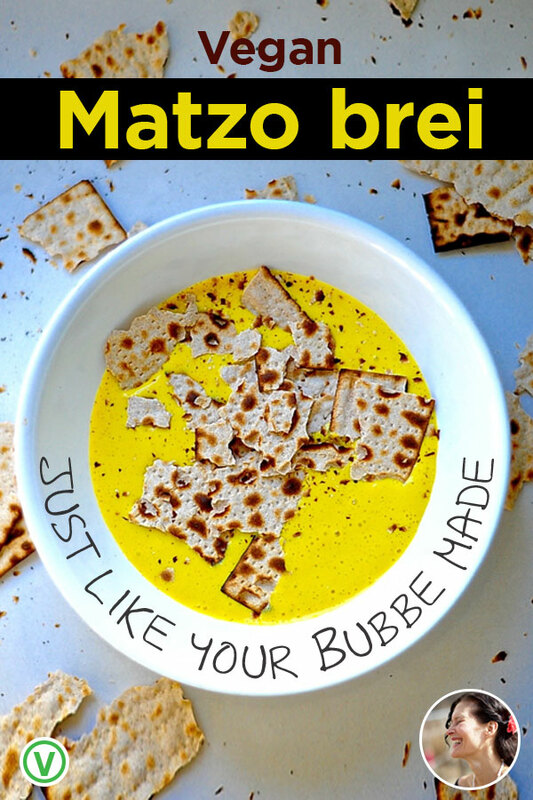 If you like a crisper matzo brei soak only for 2-3 minute. I stand in the middle and so I soak 2 1/2 matzos for the full 5 minutes and then crumble in the last one just before I cook it. While you matzo is soaking take that last 1/4 cup of silken tofu and mash it with a fork. You don't want a smooth paste as this will help approximate the curds that are formed when you cook eggs. Now stir this tofu into the soaking matzo and batter and you are ready. Now your onions should be ready. Remove them from the pan. Add your other teaspoon of oil to the pan and heat on medium high until your pan sizzles when you sprinkle some water over it. Slip your butter into the pan and swirl to coat the bottom. Now pour in you matzo mixture and spread it gently with a spatula until it cover the bottom of the pan. Allow the mixture to sit on medium heat for 2 minutes. Now using a firm spatula scrape the bottom of the pan and turn the cooked parts over like you are turning earth with a spade. Now the uncooked "raw" batter should be on the bottom. Allow the mixture to set another 2 minutes and turn again in a sweeping motion. Cook for 7-8 minute total until the mixture is set and you have a golden pile of yumminess. Stir in your onions. Top with salt and pepper. Lovely eloquent writing and beautiful pics. My condolences for your loss, but it does sound like you have warm memories and that is something to cherish. You are an absolute dear. Thank you. I liked the picture of the dish. That’s very beautiful. And immediately I wanted to try. I’ll definitely cook it. That is wonderful. I hope you enjoy every bite! “All’s well that ends” — perhaps his best line. About food at restaurants he used to quip, “Except for the taste and consistency, it’s excellent.” Wait-staff would walk away trying to figure that out. Absolutely his best line. And he was full of good lines. Lol. He confused many a waiter in his long life for a variety of reasons, mainly for his unrepentant punning. I was searching for a Vegan Sweet matzoh brie. Zero. I chose your savory Brie over the,”big guns” like Veggi Times, and other big name sites. 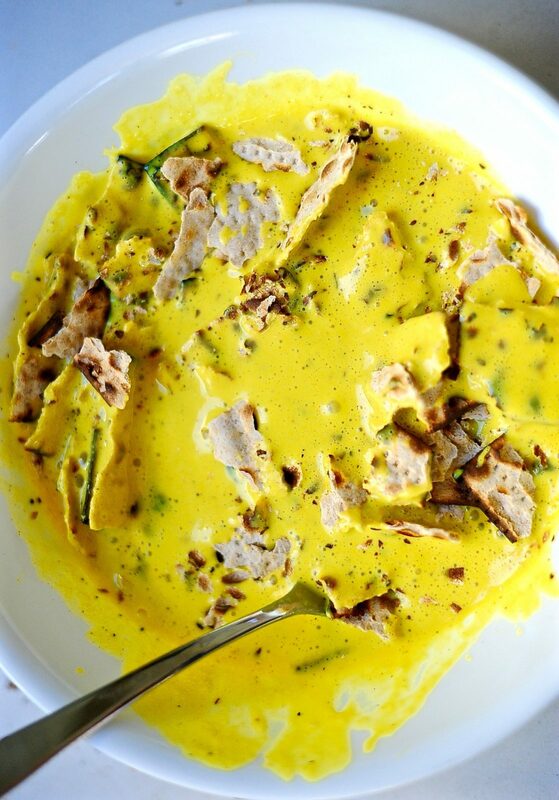 Your use of silken tofu is genius. I blended the tofu with almond milk, vanilla, maple syrup ,cornstarch, cinnamon, and turmeric for color as well as nutrient value. I nervously broke the matzohs (Yehuda brand) into the batter and let soak for around 5 minutes. I heated a teaspoon of coconut oil in the pan and it came out amazingly delicious. Did not miss the eggs. At all. 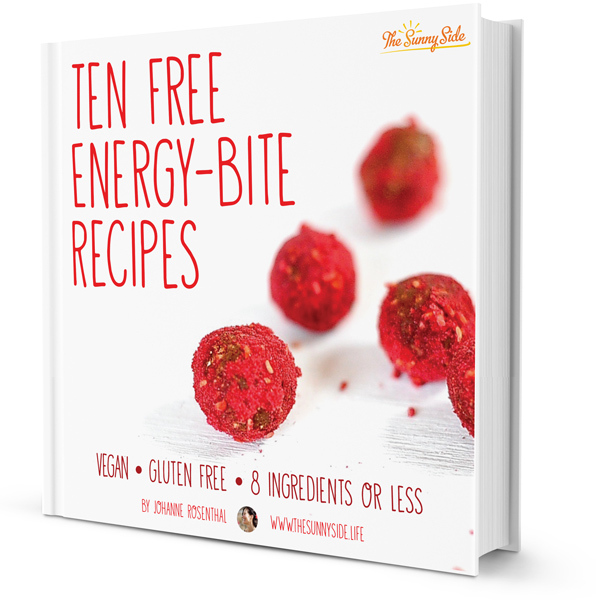 I’m simply chuffed that you took a chance on my recipe. Thank you. I’ve never had sweet matzo brei. The addition of vanilla and maple syrup sounds dreamy. I’ll try it this week end. Simcha raba, simcha raba! Aviv h’geea Pesach ba! Taferu, taferu, taferu li beged eem kisim. Mileu, mileu, mileu kisay b’egozeem!! Simcha raba, simcha raba! Aviv h’geea Pesach ba! Od me at aviv ba. Me az : Uga’at shmareem. Thank you for sharing memories of your father. The last salt is our genius! Thank you for reading my words. Black salt is a game changer alright!